I'm going to make ALL of my KISSlicer 1.6 tutorial videos publicly available! And there are lots of them in the works. The list is up to 50 topics already and I'm going to try to release 2-3 tutorials a week. Everyone will benefit from this. So, how am I going to encourage you, gentle reader/viewer, to support my work so I can continue to improve my production quality (you might notice that the audio quality in the tutorial I posted earlier today is much better than the pervious one) and continue to inspire me to create great content? Simple! 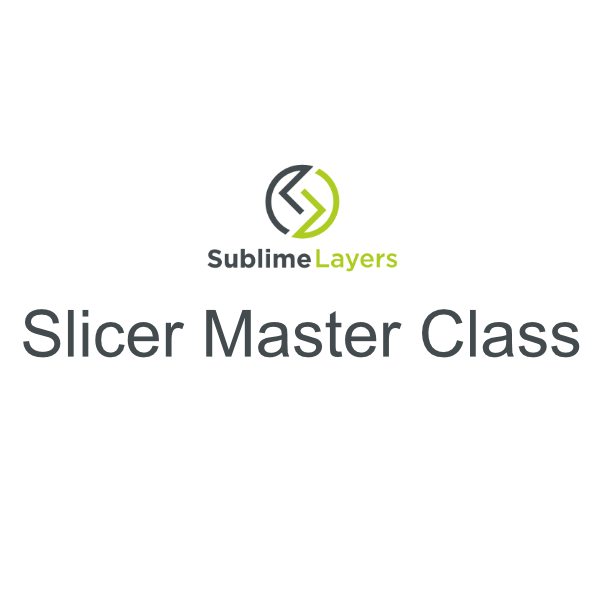 I am going to start a Slicer Master Class series where I'll focus on advanced slicing techniques for challenging parts and to produce the most beautiful prints imaginable. And, I'll host live streaming events so supporters can ask questions about their slicing challenges. I'll use KISSlicer 1.6 for the examples in the Slicer Master Class but the vast majority of these slicing techniques - techniques I've developed over five years of dedicated experimentation and work - apply to any slicer including Slic3r, Slic3r Prusa Edition, Cura, Matter Slice, Craftware, and Simplify3D. This content and live streaming events are targeted at more sophisticated users and will only be available to my Patreon supporters until I reach 100 members, then I'll release them publicly. As discussed in the comment section, my goal here is to get a critical mass of supporters (at least 100) to help keep me motivated to produce great 3D Printing related content. I understand that some folks prefer one-time donations and I've always treated these as first-class supporters (because you/they are!). So, I've created a PayPal donate button that anyone can use to support my work. $10 or greater contributions through this button will also count towards my goal of 100 supporters. Now you have two ways to hop on board, support my work and get access to great content that you won't find anywhere else. 4 comments to ''Plan B"
What level does one need to be at to unlock the master class series?? over 1 dollar or 5 dollars?? An idea. How about a one time donation for fee sort of as a trial run. or say 1 dollar per master class video depending on length of content or something. I don't really like being tied to a monthly fee. Perhaps a forum with a private section for paying users. I am not a huge fan patreon. Thank you for the feedback Geirhart. Donations at any level are fine! I would like to do one time donations but the Patreon platform does not support that and really, my goal is to get some critical mass in the form of 100 subscribers so I can make all of this information public as quickly as possible. It adds a lot more work on my end to set up and manage permissions, keeping some information private to a group, etc. I do accept PayPal donations at mhackney@eclecticangler.com and my policy has always been to treat one-time donations on PayPal as first class supporters. All of the action takes place in my private Slack channel and their are sub channels set up for draft copies of my book (another perk of supporting me), the Slicer Master Class and other things. I am going to try to add a PayPal Donate button to this post above and also on my Blog so give me a couple of minutes. Donations made through that button will contribute to my 100 supporter goal if the donation amount is $10 or more. Does that sound like a reasonable option? Thanks for taking the time to discuss this! That does sound like a suit able solution. Mike thanks for access to the chat. May I get access to the master class videos too?? ?